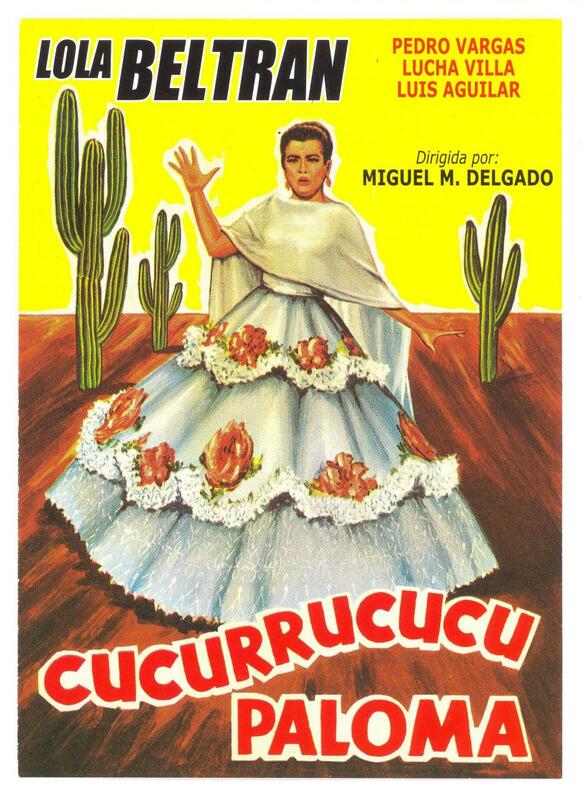 Cucurrucucú paloma is a Mexican Huapango song written by Tomás Méndez in 1954 and introduced by Lola Beltrán in the film Cucurrucucú Paloma (Miguel Delgado, 1965). The song also appeared in other movies, such as Escuela de vagabundos (Rogelio A. González, 1955), considered one of the finest comedies of Mexican cinema, later adapted from the screenplay for the MGM movie Merrily We Live (Norman Z. McLeod, 1938); The Last Sunset (Robert Aldrich, 1961); Happy Together (Wong Kar-wai 1997); Talk to Her (Pedro Almodóvar, 2002); My Son, My Son, What Have Ye Done (Werner Herzog, 2009); and The Five-Year Engagement (Nicholas Stoller, 2012). It has also been recorded by popular singers such as Luis Miguel, Rocío Dúrcal, Pedro Infante, Perry Como, Caetano Veloso, Miguel Aceves Mejía, Harry Belafonte, Nana Mouskouri, Julio Iglesias, Shirley Kwan, Lila Downs, Joan Baez (on her album Gracias a la Vida), Rosemary Clooney, and The Del Rubio Triplets. It was played as a regular huapango song until Harry Belafonte sang it in Carnegie Hall like an <a title="Art song". Lola Beltrán's original rendering is considered by Mexicans to be the most powerful and faithful to the spirit of the song. a que regrese la desdichada. qué van a saber de amores. with its wide open little doors. hoping still for the return, of the ill-fated woman. What will these stones ever know, little dove, about love? Rockwell’s early version of the rooftop onlookers included “devout native Israeli, Christian, Jewish and Mohammedan.” The picture was a compromise between Rockwell and Look’s art director, who wanted him to omit the Arab and one soldier. 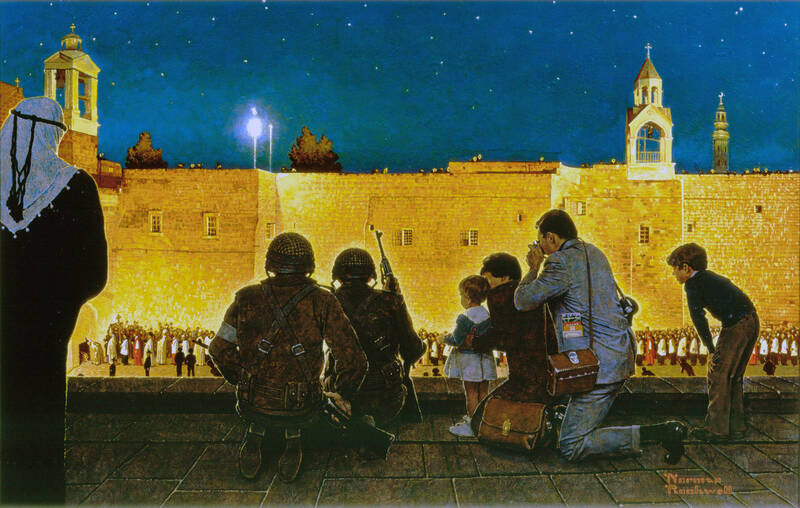 But Rockwell kept both soldiers, “They never seem to go singly about the streets of Bethlehem,” he said. Another compromise was made when, at the art director’s request, he removed the tourist family’s souvenirs and guidebook from the painting. Look wanted Rockwell to do portraits of Prime Minister Golda Meir, Jerusalem Mayor Teddy Kollek, and General Moshe Dayan during his five-day stay in Jerusalem. Rockwell met with Meir at her home and with Kollek. Dayan, however, would not meet with him. Rockwell later did a portrait of Mayor Kollek based on photos taken during the visit, but Look decided against the project and never published the portrait.